Example: Gracias por dejarme los 10 Euros, me vienen al pelo = Thanks for lending me the 10 Euros, they’re just what I need right now. Os quería pedir un favor, que me vendría al pelo – I wanted to ask you a favour, which would be a great help. People occasionally ask us how Notes in Spanish began, or for advice about how to set up a podcasting project/business like Notes in Spanish. 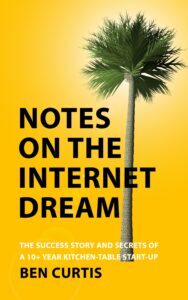 To answer that question, Ben has written a short book, ‘Notes on the Internet Dream’ which will hopefully be out within the next two to three weeks in Kindle and paperback. As I finish the final manuscript, I’d be grateful if anyone who might be interested in this book could send me ideas or questions for what it should cover. So I don’t miss anything out! No one knows Notes in Spanish like you guys, so you’re the best people to ask. So far the book tells the story of the ‘aha’ moments that led Notes in Spanish to exist over 10 years ago, contains inspiring ideas about how to easily start an online business (or any project! ), a complete walk-through of how the website works and how we earn a living, and a ‘philosophical’ section on things like working from home, how much money a business needs to generate, ‘moral marketing’, and what to do when an online business finally frees up lots of your time. If you have any other ideas that you’d like to see in the book, or questions you’d like to see addressed, please let me know in the comments below. ¡Me vendría al pelo! I’ll let you all know when the book is published, for those that are interested, and meanwhile will be back soon with more super-useful Spanish phrases.